HOUSTON, Texas (CNN) -- The drawings are macabre, especially because they're created by children: stick figures writhing in pain and confusion, a knife dripping with blood and a broken heart. Child counselors say that for kids, art therapy can be more effective than traditional therapy. 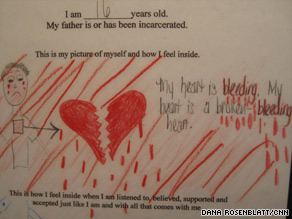 Next to the heart, the child artist has written: 'My heart is bleeding, my heart is a broken bleeding heart." Another child has drawn a red bubble, inside of which is written: "I want 2 die." All of these young artists -- members of a program called No More Victims -- have at least one parent who has served time in prison. The powerful drawings communicate their experiences with pain, hopelessness and confusion as clearly as a thousand spoken words. Many of these at-risk children were raised in unstable environments, which could lead them to make the same mistakes as their parents, sending them to prison or worse. In 1993, she founded No More Victims Inc., a nonprofit organization dedicated to helping children of incarcerated parents. A former Texas parole officer, Gambrell saw firsthand the need to help children and teens who were left behind by one or both parents serving time. "My goal is for this child to feel healthy enough and healed that they didn't want to take their own life or someone else's. Just give them what they need, love them, support them, provide basic needs. They will fly," she says. Soledad O'Brien leads a town hall with some of the most influential voices in black America to examine innovative solutions to some of the critical issues facing African-Americans as CNN and Essence present "Black in America: Reclaiming the Dream." The statistics on prison parents are staggering. According to Justice Department estimates, 2.3 percent of children under 18 in the United States have at least one parent in prison. Together, 52 percent of state prison inmates and 63 percent of federal prisoners reported an estimated total of 1,706,600 minor children, according to the Justice Department. In 2000, Gambrell brought No More Victims to the classroom at a local high school where a large majority of students had experienced the effects of incarceration on their families. Sound off: How can we reverse the cycle of incarceration? Soon after, she opened a community center where teens could take care of basic necessities such as getting food and diapers for their own kids, doing their laundry, and getting, from Gambrell, the love and support they never had. Some of the teens had fallen victim to sexual assault as children and later received help from No More Victims. For the program members, the community center feels like home and Gambrell is a lot like a mother. She makes herself available to the kids 24 hours a day, seven days a week. Her approach is simple but effective. Since the program's onset in 2000, only 22 of the 700 kids who've enrolled have ever gone to prison, says Gambrell, and many of those kids graduate high school. Child counselors say that for getting young people to open up, art therapy can be more effective than traditional forms of therapy. In the classroom, it could take months or years for her students to share what they've been through. But with art therapy, Gambrell has created a safe outlet for them to express their innermost thoughts. "Kids reflect what's going on in their life in their artwork," said Mary Ellen Hluska, an expressive arts therapist for the Child Life Department Johns Hopkins. Sound off: How can we reverse the cycle of incarceration? "I think it's effective because it helps them have a safe place to express what they've been through without using words," said Hluska. "It becomes a tangible object. It's there, and they don't have to say it." In class, Gambrell instructs the students to use red pencil to express pain and anger they felt, and blue to reflect calmness and peace. "I knew it would be deep because ... I had red and blue pencils for them, and no child wanted a blue one," said Gambrell. "In the first exercise, everybody requested red," Gambrell said. "And some children had four and five red pencils. They drew so much and colored so hard that they actually broke the lead." Longtime program member Shante Weaver often used red pencil to illustrate the struggles of her life. Her mother has been in and out of prison most of Weaver's 20 years, and she's never really known her father. Drawing delivered a key breakthrough at age 15, when a quiet and withdrawn Weaver finally revealed all that had happened to her. Shortly after Weaver drew the picture, she found the courage to talk about her troubled childhood, inspiring other members of the class to join her in speaking about similar experiences. With the support of her classmates and Gambrell, Weaver gathered the courage to press charges against a man who had abused her for many years. Today, Weaver lives with her grandmother and works two jobs to help support her family. She also takes classes at a community college and plans to continue her studies to become a nurse. Weaver is still an active member of No More Victims and is a role model to newer members, helping them get on the right track. Looking back, Weaver said she feels like a different person from the traumatized 15-year-old girl who drew those red pictures five years ago. Thanks to No More Victims, Weaver says, she can use a blue pencil to best illustrate her brighter future.